You can highlight text in Outlook to quickly draw a reader’s attention to key information. 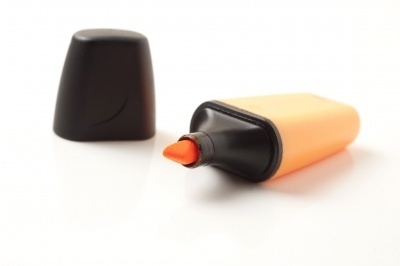 This can be useful to help them focus on specific information in a big chunk of text. In fact, there are many formatting features available in Microsoft Outlook that you can use when composing Email messages, including colored text and different font types. An Email works best when it is simple, easy to read, and can be quickly scanned by the recipient. If you add too many different formats to an Email, the message can become hard to read. And if someone is reading the Email on a tablet or smartphone, excessive formatting can make things especially difficult to view. Highlighting does not always print-out well on black and white printers. This is especially true for dark or bright highlight colors. For this reason, always stick with light colored highlights, such as yellow or light blue. The highlighter is available in the “Format text” tab of the Microsoft Outlook Ribbon bar. There is a little highlighter symbol with "ab" next to it. The pull-down arrow displays 15 available highlight colors. First, you must have Microsoft Word set to be your Email editor. Select the tab called “Mail format”. Select “Use Microsoft Word” as your editor. Lastly, select “View”, “Toolbars” and “Formatting” to display the formatting ribbon that contains the highlighter (screenshot not shown). If you make a mistake, select “No color” in the pull-down, and use the highlighter to “erase” the incorrect highlight. When done, to turn-off the highlighter, select “Stop Highlighting”, hit the “Escape” (“Esc”) key, or just keep “typing” and it will turn off automatically. Some people find it easier to highlight after they select their text. 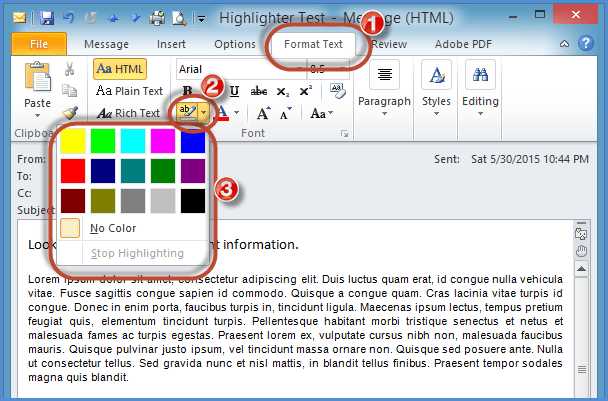 To do this, select the text you want to highlight, go up to the Outlook Ribbon Bar, and select your desired highlight color. Any text you had selected will now turn that highlight color. I use this method, since I find I make less mistakes this way that I need to "undo". I only hit the highlight key when I know I have selected the correct text. This feature also works well along with color coding your Emails in your inbox. Do you highlight text in Outlook in your Email messages? Do you find it helpful or distracting in messages you receive? Need help with Outlook? Check out our Email Overload Store!